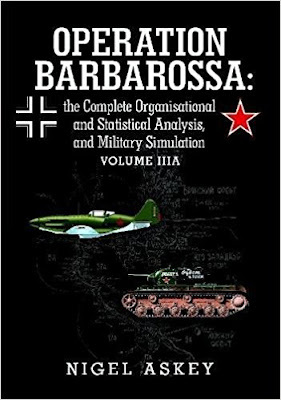 Volume IIIA relates to the Soviet armed forces, mobilisation and war-economy during 1941. All significant Soviet weapon systems and combat squads used in the campaign are analysed, along with a contextual history. An assessment of each weapon system's inherent 'combat power' is provided, as well as attributes such as the relative antitank and antipersonnel values. Volume IIIA then focuses on the detailed Shtaty (Toes) for all the Soviet land unit types fielded during 1941. All significant units in the Rkka (Red Army), Vvs, Vmf, Pvo and Nkvd are included; ranging from the largest mechanised corps and tank divisions, down to small mortar battalions and Nkvd security companies. Also included are the most detailed Orders of Battle ever published on the Red Army, Pvo and Nkvd forces in June 1941. Even small and obscure units are included down to battalion and company level. Lastly, Volume IIIA examines in detail every unit's actual personnel and equipment in each of the Ussr's Western Military Districts.